UPDATED: Thu., April 4, 2019, 9:55 p.m.
KANSAS CITY, Mo. – Groundbreaking work by a University of Kansas doctoral student has provided the most detailed evidence yet for one of the most storied moments in the history of the Earth. The moment is the day that a colossal asteroid smashed into the planet some 66 million years ago, igniting worldwide forest fires, triggering tsunamis, earthquakes and volcanic eruptions, and sending a plume of debris into the atmosphere that so darkened and poisoned the planet that it wiped out 99 percent of life, including the dinosaurs. The work by Robert A. DePalma, a 37-year-old geology student who is also a paleontologist at the Palm Beach Museum of Natural History in Florida, was published Monday in the prestigious Proceedings of the National Academy of Sciences. Eleven other scientists of renown share authorship of the paper. But the lead author is DePalma, based on what he knew was a major find in 2012. Scientists for decades have known that the extinction of the dinosaurs is tied to a massive asteroid that hurtled into the Yucatan area of eastern Mexico. That strike, known as the Chicxulab impact, is recorded as a layer of rock called the KT boundary, named for when the Cretaceous period ended and the Tertiary period began. Until DePalma’s discovery, scientists had little direct evidence to show what actually happened on that day. In North Dakota, at a site called Tanis, within the Hell Creek geological formation, DePalma found a paleontological treasure trove of perfectly preserved animals and fish fossils – heaps of them piled and layered – at the KT boundary, tying them to within minutes of the Chicxulab impact thousands of miles away. The paper reveals how the impact created a magnitude 10 or 11 earthquake, sending a seismic wave thousands of miles upland. A surge of water swelled inland seas and waterways, heaving fish onto shore to suffocate. Meantime molten material spewed into the atmosphere with the explosive energy of billions of atomic bombs. The Tanis site was riddled with glass blobs and debris known as tektites and powdery microtektites. The site seemed to have millions of them, a clear signature that the deaths had occurred on that very day. Fish gills were filled with tektites, a sign that they were breathing them in just before the water surge ejected the fish onto land. “This is a huge find. 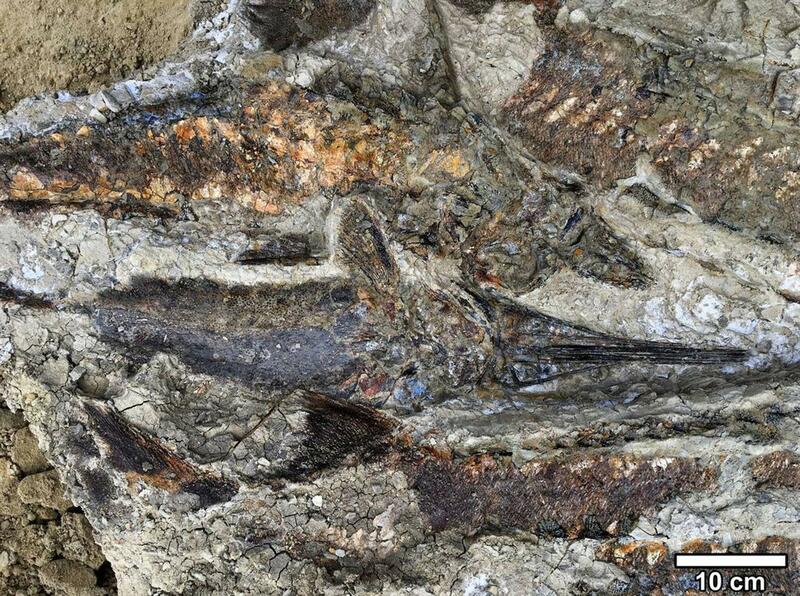 It is a discovery that is made once in a century,” said researcher David Burnham, one of DePalma’s University of Kansas doctoral advisers who leads the fossil preparation lab at the university’s Biodiversity Institute. “Nobody has found anything like this for any impact that we know about. Burnham said that the University of Kansas is already in possession of the fossils to become part of its permanent collection. The April 8 edition of The New Yorker magazine, which appeared online Friday, features a major feature story titled “The Day the Dinosaurs Died” on DePalma and his find. Alvarez, based at the University of California, Berkeley, pioneered the idea that the dinosaurs were killed by an asteroid. He is one of the authors of the paper. The subsequent extinction of the dinosaurs would lead to the rise of mammals and, eventually, human beings. “It is difficult not to get choked up and passionate about this topic,” DePalma said in a University of Kansas statement. “We look at moment-by-moment records of one of the most notable impact events in Earth’s history. No other site has a record quite like that. And this particular event is tied directly to all of us – to every mammal on Earth, in fact. Because this is essentially where we inherited the planet. Published: April 4, 2019, 7:36 p.m. Updated: April 4, 2019, 9:55 p.m.